It's important when bed or mattress shopping that you buy a bed with the right dimensions. Whether you're getting a double bed, king sized bed, single bed or otherwise, the measurement of the bed is most important in relation to the measurement of the bedroom floor space available for it. With this UK bed size guide, we hope to prevent people from making the 'big' mistake of buying a bed that's too 'small' for them! In the UK, most modern beds and mattresses are constructed and measured using metric dimensions (metres/centimetres). But to make things easier, we've also provided you with the dimensions in feet and inches too. Not the bed sizes you were looking for? Want something more tailored to you? Why not contact us with your requirements and we will be happy to help. We can cater for almost any size (or shape!) that you may be looking for. What are all the bed sizes? It can be easier to visualise exactly how big is a double bed when drawn next to a single bed and a kingsize bed for comparison. 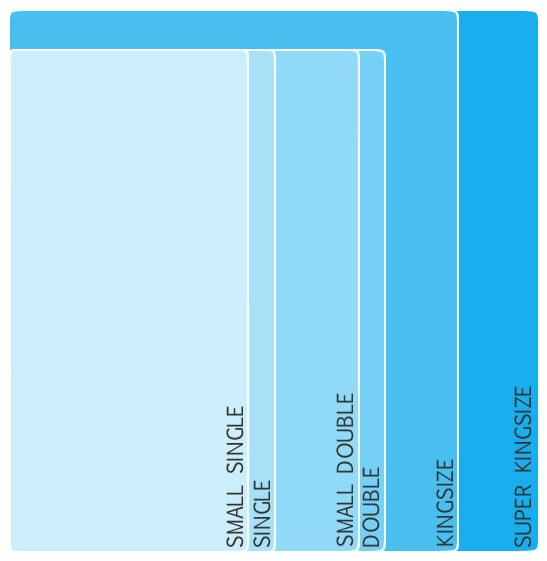 If you're upgrading from a single to a double, or a double to a kingsize, our bed size diagram above will give you an idea of how much bigger your new bed will be. 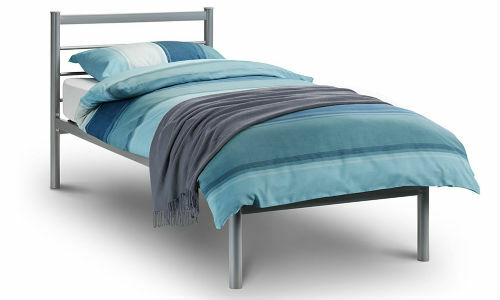 Small Single Beds (also known as a European Single Bed) are suited to one person who doesn't require much space. They're a good size for older children who have outgrown their toddler beds. In many hotels, this will be the standard size for a twin size bed, as they can be combined together to create a kingsized bed. 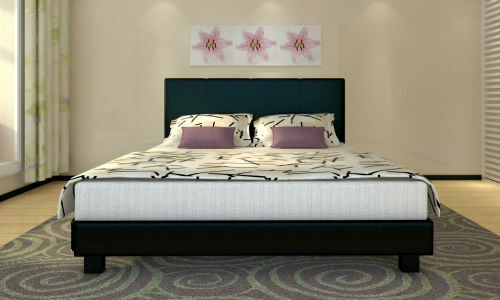 Single Beds will suit the average-sized adult or as a child's first bed to grow into and are the most common standard sized single bed, as well as the most popular bed. Small Double Beds (also known as a Queen Bed) can fit two adults, but could be a tight squeeze. They are more suited to one person who may require or prefer more space to sleep, lack of floor space in your bedroom or couples who like to sleep more closer to each other. Double Beds can comfortably sleep up to 2 persons and are the most common bed size for couples. They provide enough space for a couple to sleep comfortably without disturbing each other. For one person, they offer more than enough room to roll around in your sleep without falling off! 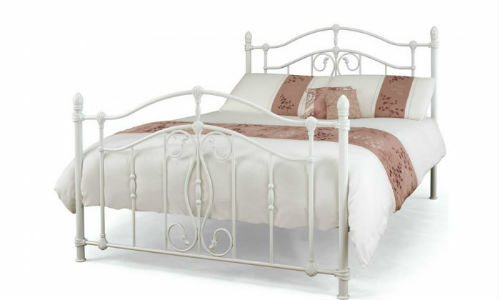 Kingsize Beds are perfect for those who like to have a lot of space! Whether you're looking for a kingsize bed to sleep a single person or a couple, there's more than enough room to roll around or toss and turn. For taller people, the added length to the bed will also mean that your feet won't be hanging off the end! Super Kingsize Beds are also known as the European Kingsize Beds and is normally seen as the biggest bed. More space than one person could ever need in a bed, and a luxurious amount of sleeping space for a couple. Who knew beds could come in many different shapes, styles and sizes? Is a twin and a double bed the same? Despite its name, the twin bed by itself isn't for two fully-grown people, but on its own is the same size as either a small single or regular single bed. The term "twin bed" comes from the fact that two single beds can be pushed together and make up a bed the same size as a double bed. Thus, both the twin beds and the double beds are not the same - but will be the same size if you have two (twin) single beds. Is queen bed bigger than king size? The queen-sized bed is not bigger than the king-sized bed. It can sometimes be tricky to understand the differences between these two beds, with a lot of people seeing them as being equal to each other, or as an interchangeable word. This is not the case for UK bed sizes. A queen-sized bed is actually the same size as a small double bed, thus buying this bed and expecting it to be as big or if not bigger as a king size may just arise a few problems! What's the biggest bed size? 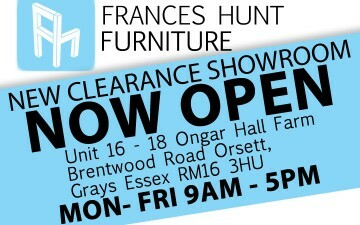 The biggest most well-known bed size that many retailers, including Frances Hunt, offer is the super kingsized bed. There are, however, bigger beds in the form of eastern king, emperor and the caesar bed which measures a strong 245cm x 220cm! If you're looking for something more custom, be sure to contact us and we'll be happy to see what we can do. Do two twins make a queen? Two twin beds do not make a queen bed with bed sizes in the UK, as a queen bed is not that much bigger than one 'twin' or a single bed. Two twin beds would make up a double bed. Which bed size is the smallest? The smallest bed size is a small single bed, but other than that, particular beds for toddlers and babies do exist and they will be much, much more significantly smaller. These may not always feature a mattress as such, but will be somewhere of which a small child can sleep upon. A lot of parents opt to get a child a single bed as their first bed, as it allows the child to grow into it. 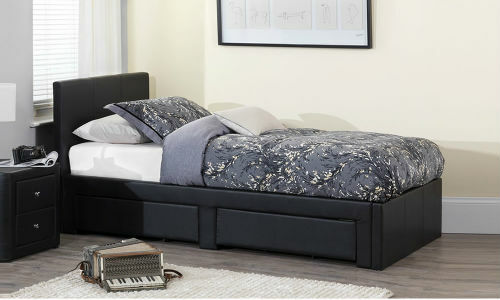 No matter how big, small or peculiar shaped your bedroom is, we are sure to offer a bed that is ideal for you, and this handy guide is a great place to get started in finding the right sized bed to fit comfortably and practically into your bedroom. 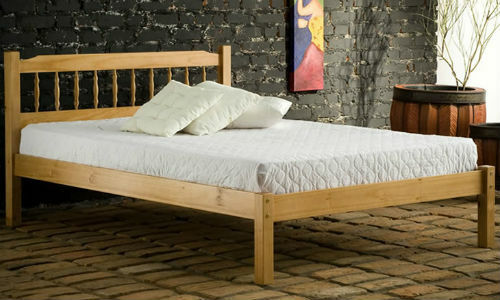 Be sure to explore our wide variety of beds.